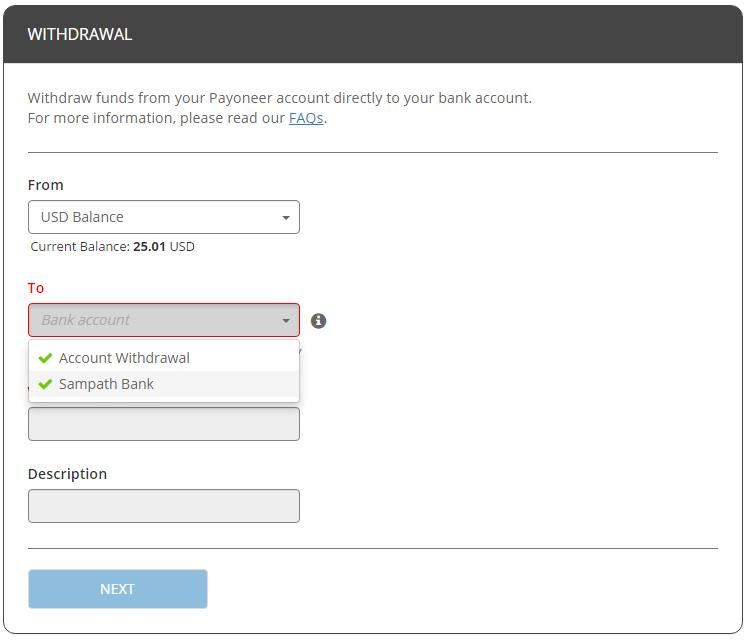 Since I experienced few inconveniences with Sri Lankan banks while depositing the CJ.com checks, I have decided to open a Payoneer account to transfer my earnings directly to my bank account. I would like to share my first Payoneer to Sri Lanka experience with those who are new to the Payoneer and interested in Freelancing in Sri Lanka. I opened my Payoneer account on 8th March 2017, and they approved my application within one day. 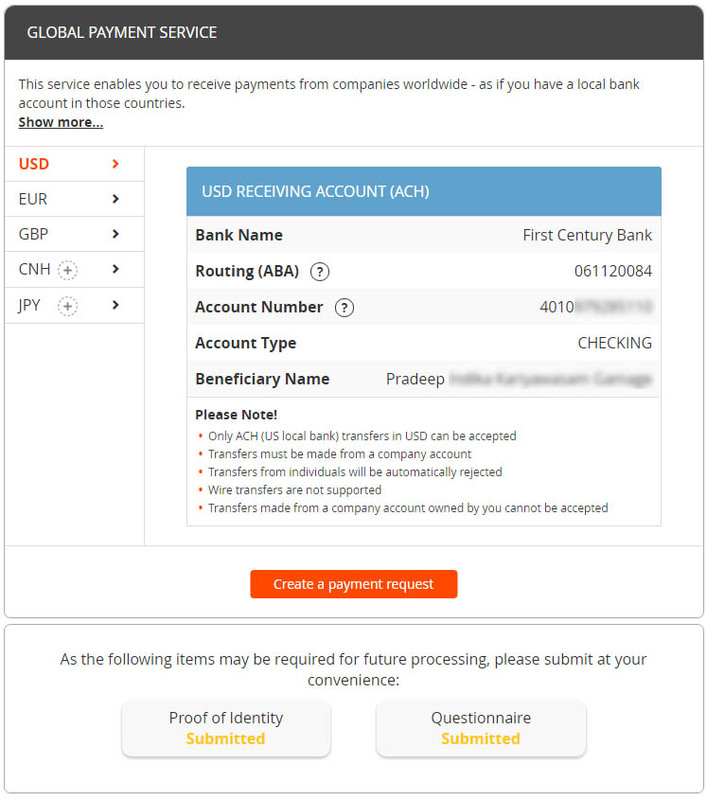 * There was one confirmation (ID) step to verify before receiving payments from Payoneer to Sri Lanka. According to their terms, I provided my government issued Driving license scanned copy as the final step of the registration. 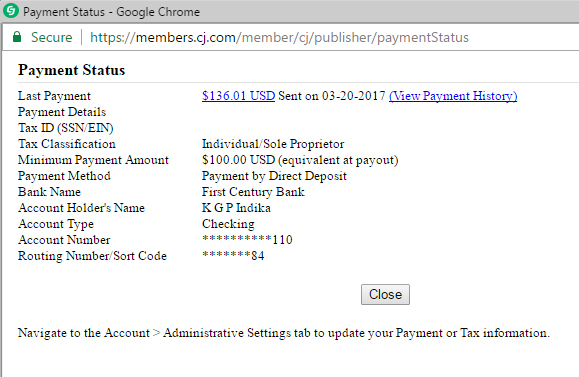 On 20th March CJ.com has made the direct deposit to my Payoneer Account (First Century Bank in the US). 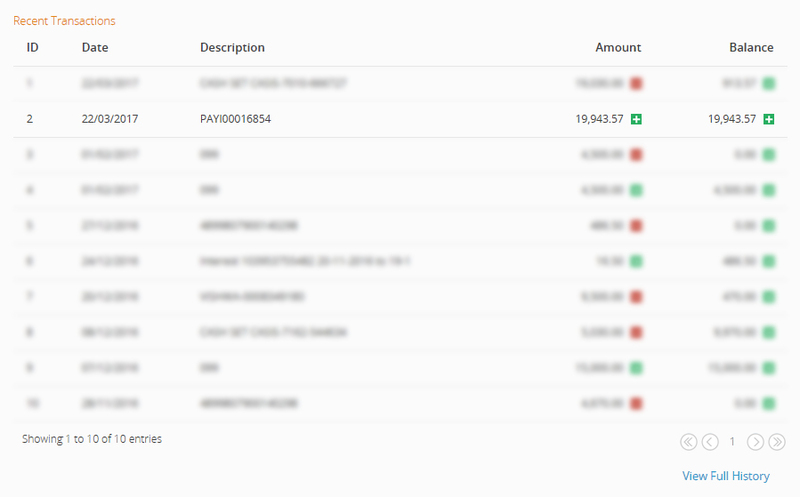 Within one day the amount was reflected in my Payoneer Account. 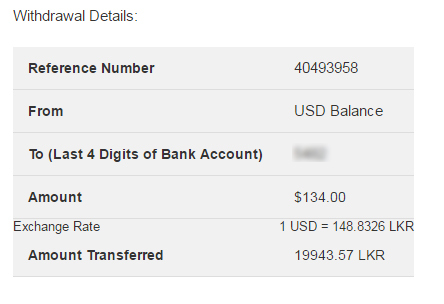 Then I requested a payment of 134US$ (withdraw) from Payoneer to Sampath Bank. Within few minutes the amount was reflected in my Sampath Bank Account ( Sampath Vishwa Online ) as follows. 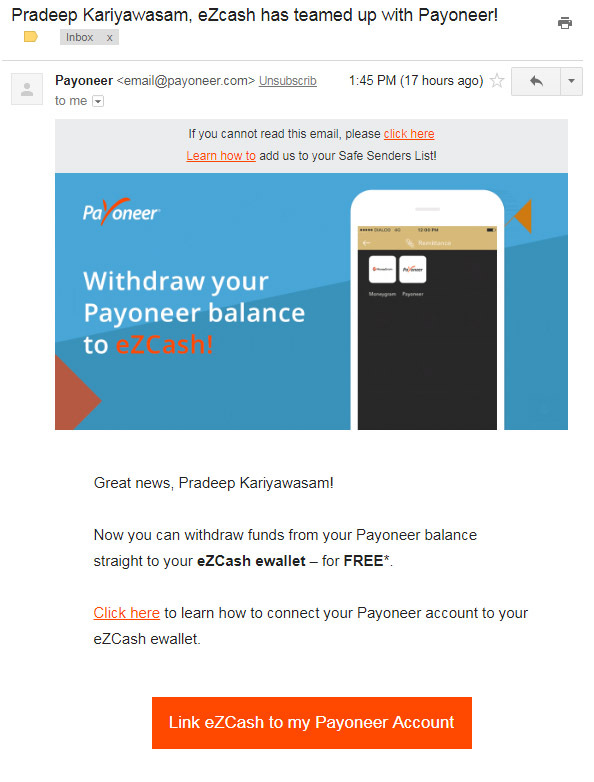 Surprisingly today (23rd March) I got another email from Payoneer that mentioning I have received another 25$ as a bonus from them. 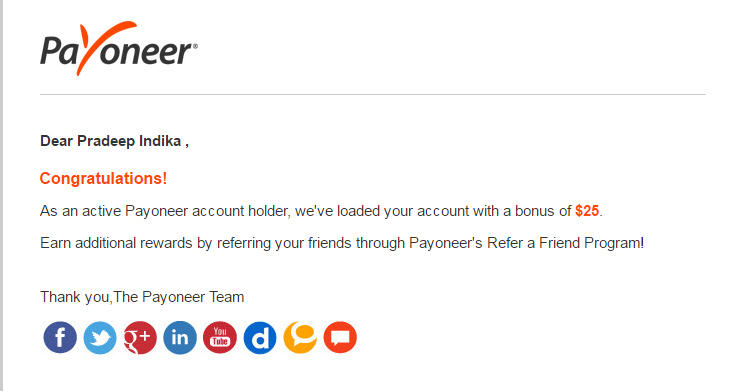 By clicking following link or the image you will also able to get 25$ free bonus from Payoneer. 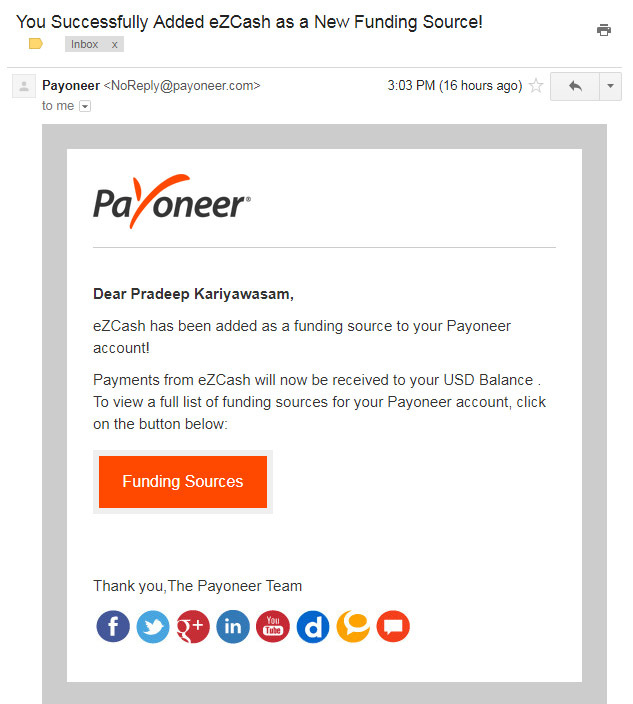 Today revived an email from Payoneer, News about Dialog eZcash as funding source to transfer money. By following the instruction given, with in one minute I was able to Link eZcash to my Payoneer Account.